security products to ensure you are getting the best service possible. We realise that many commercial businesses are operated from their vans and therefore need a higher level of locking systems. 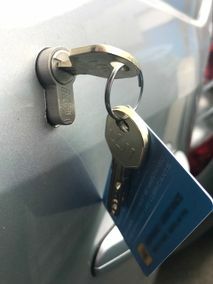 We provide a full mobile vehicle locks service for your convenience, so whatever your queries or needs please do not hesitate to contact us on 07760 247247. With the increasing amount of vehicle crime it has become a necessity for commercial companies to improve their vehicle security. With many vans carrying high value stock, tools and equipment, there is a greater chance of theft for your company. Losing your equipment can cause major affects on your business, your company's reputation and not to mention the value of stock lost that may have taken you years to build up. We provide a comprehensive range of Vehicle security options in and around the Hertfordshire area, specialising in a variety of Van Locks. By adding an extra locking point to your vehicle, you are installing a powerful deterrent to thieves, leaving you with the reassurance that your vehicle is safe left unattended. Not only do we supply and install our security products, we also have no call vehicle securityout charge, with a fast and reliable service. Our experienced engineers are able to work as a mobile service giving you the option to have your vehicle locks changed whilst at work, saving you the hassle of taking time out of your work day. For more information or a free quotation, please do not hesitate to contact us.